Where one door closes shut, another one creeks open. 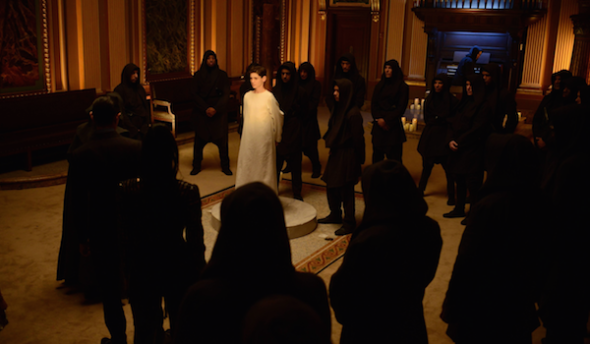 The fall finale of Gotham managed to do both with mixed success. The Theo Galvavan plot met its end as did the whole Saint Dumas revenge mission. We also got teases as to what will come in the second half of this season. There was a name drop of Hugo Strange but we did get to see Mr. Freeze in some form (at least with a freeze gun of sorts). The events of this episode have placed Gotham at an interesting crossroads going into hiatus. I did not like the “monk revenge” plot from its inception. As compelling as I found the back story, the lack of physical intimidation did not warrant any investment on my part. This episode was no different and was even further embarrassed because Selina managed to take down a few monks. These guys were about as threatening as the henchmen from Mighty Morphing Power Rangers. During the previous episode, Galavan managed to physically outmatch Gordon rather easily. I don’t understand how he was able to do this but the monks were completely expendable. Due to their lack of intimidating qualities, I never felt like Bruce was in any danger whatsoever. Speaking of Theo, we finally saw he and his sister part ways. Once again, I had mixed feelings about this. I liked how Tabitha jumped to the defense of Silver. When she gave Silver the other parachute, it symbolized her taking matters into her own hands. Throughout this season, Tabitha has always been second fiddle. Her and Theo had a physical confrontation of sorts but it came off as anti-climactic. She hit him once and that was enough. Throughout the episode, Theo really did not get a proper send off until his final scene. Theo’s end tied into Gotham’s strongest element; the Penguin/Gordon relationship. In the first episode, Gordon chose to spare Penguin instead of killing him. 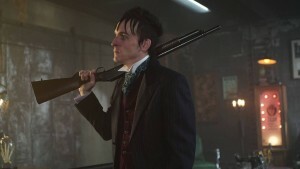 In the first episode of this season, Gordon killed someone for the benefit of Penguin. Here, Gordon crossed perhaps the biggest line thus far. Penguin and Gordon drove Theo to the edge of the city after Penguin knocked out Capt. Barnes. After watching Penguin beat Galavan with a bat, Gordon shot Theo. Not only that, he allowed Penguin to shove an umbrella down the deceased Galavan’s throat. Going forward, Gordon has no real leg to stand on as an honest cop. He murdered someone in cold blood and can’t say that he had no choice. No matter the outcome, this moment was a highlight of the entire series. Although this season has been considerably darker than the last, Gotham still struggles at times with tonal consistency. During the last episode, Alfred was put into mortal danger. The resolution to last week’s cliffhanger was played almost entirely for comedic effect. Not only that, the sheer contrivance of having Lucius Fox and Alfred barely separated was a “smack my head moment.” Some of the comedic moments did work such as when Gordon woke up in the company of Nygma and Penguin. It looks like the show will no longer be concealing Riddler going forward. The final scene with Mr. Freeze puts me in a weird situation. I’ve said previously that I am not a fan of introducing every future Batman villain for the sake of doing so. Then again, Batman will never show up on this show. I think Gotham should continue to function as its own world. The Freeze we saw at the end looked to be in the midst of his vigilantism. He didn’t appear to be stuck in a sub-zero suit but did freeze someone in an alley. This scene was actually a great homage to The Terminator in a way. He doesn’t appear to be a full villain yet but he’s not just an innocent doctor. Unlike a lot of the characters they’ve introduced, I am curious to see how he is handled in the second half. As a midseason finale, this episode succeeded at keeping me excited for the future. Some of the events of this episode lacked a great sense of finality. The monks felt pointless, Tabitha turned on Theo rather abruptly, and everything with Bruce and Silver felt like a retread. The entirety of Gordon/Penguin during this episode made it all worthwhile. It was definitely a better final episode than both the midseason and season finales during last year. There’s been a great deal of progress for this show during season two. My hope is that it continues to do so.